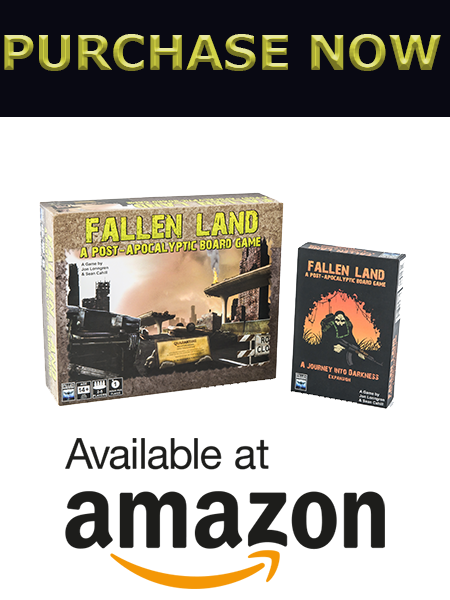 Fallen Dominion Studios is an Iowa based indie game company and the home of Fallen Land: A Post-Apocalyptic Board Game and its first expansion, A Journey Into Darkness! We burned the midnight oil from 2005-2017 to develop and produce these epic sandbox-style board games that feature unlimited unique game play. We have TWO expansions well underway, in addition to several exciting NEW board games, so stay tuned! Kas and Bryan From The Dice Odyssey's Review Fallen Land: A Post-Apocalyptic Board Game! Bower's Game Corner: Fallen Land: A Post-Apocalyptic Board Game Review Winner Of Bower's Best Award 2017!